32 year old Cliff Dixon was shot outside of SL Lounge in Atlanta around 1 AM on March 21st. He was there to celebrate his 32nd birthday, which actually fell on March 17th. Cliff was reportedly standing in the parking lot waiting to go inside the club when a “Black male wearing black clothing and black skull cap” opened fire, reads reports. Officers reportedly pursued the man before he got away. 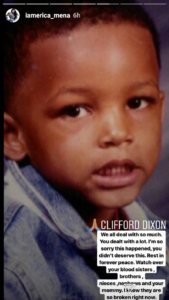 Cliff was rushed to Atlanta’s Grady memorial hospital where he was later pronounced dead. Cliff, a former college athlete is a regular among the NBA crowd, regularly seen with Kevin Durant, who is rumoredly referred to Cliff as his “brother”. The two reportedly grew up together playing basketball. Cliff would later try his hand at rapping, gaining the respect of rappers such as Meek Mill. 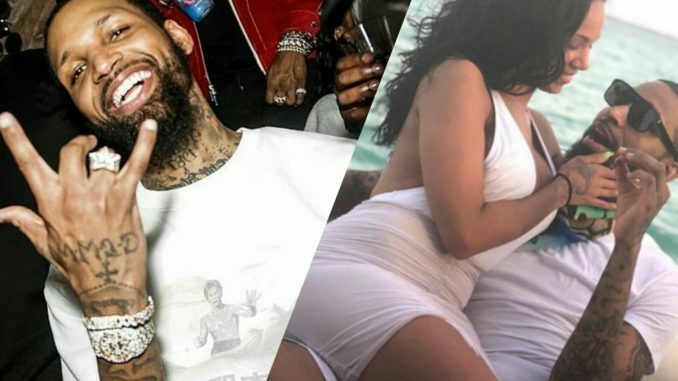 Most recently, Cliff was involved in an ongoing beef with ex-girlfriend Erica Mena following a domestic dispute where they were both arrested in October of last year. An investigation of Cliff’s murder is ongoing. 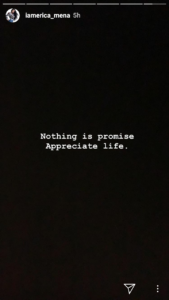 After his passing, Erica Mena posted a childhood photo of Cliff and told him to watch over his “blood brothers and sisters”, which seemed a bit shady towards his friends and his famous friends who referred to him as their “adopted brother”.